Sorry about this one – but I have an event in Sheffield – Seven Hills – this weekend that has absorbed much of my time, either in getting ready for running or assisting in preparation for All Rolled Ups attendance at the event. On the positive side, I will get to run a game of Symbaroum on Saturday evening, using an adventure written by Isak Ström based on some of my original thoughts on The Sleepless Path. I have started running the adventure this week with my local gaming group – and I’ve had positive feedback on the tone. I did a little improvisation at the beginning at Thistle Hold, which I will change for the run tomorrow because it didn’t work quite as planned. Too much freedom can be a bad thing – and in a 3.5-hour convention slot, too much freeform means you end up running over! This offers me a chance to roll out my custom play mat and use the 6-pack of guards – which I’ll post up as a complete set next week. I also had some business cards made up with the web address for Järnringen and The Iron Pact on the back. UPDATED: You should have head over to Järnringen and checked out The Copper Crown – a physical book bringing together adventures The Mark of the Beast and Tomb of Dying Dreams, printed on high-quality paper. However… as a limited print run, it’s now sold out. Perhaps try eBay or Amazon. 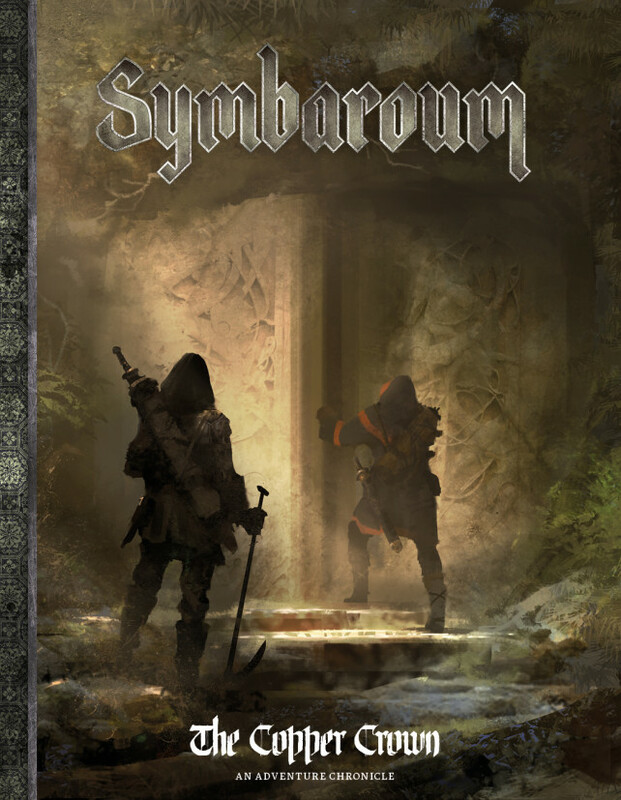 Over on Reddit, someone interested in the current French crowd-funding for a translation of Symbaroum has asked for thoughts on the game – what do you like about Symbaroum? What don’t you like? If you have had the chance to play the game, you can contribute to the comments with your thoughts. If, like Foobyx, you have not played Symbaroum yet, this could be the place to get more views from players who have. I hope if you haven’t that The Iron Pact has gone some way to expand your understanding for and excitement over the game and setting! I continue – with some slips and pauses – to post brief encounter ideas for Symbaroum on Twitter as The Iron Pact. At the moment, I have reached about the halfway point through 100 encounters for city adventures. You can contribute your own encounter ideas – or download the fancy PDF or plain PDFs of the previous Forest Encounters. Next up? I think it might be time to delve into the ruins beneath Ambria and Davokar with a little treasure-seeking through the ruins of the Symbaroum Empire.